If you live in a small apartment and you’re in need of proper high-end wine storage then take a look at EuroCave Compact Wine Cabinets. The French company, EuroCave, has been manufacturing self-contained, refrigerated wine cabinets for more than 30 years so they have considerable experience in developing and creating top of the line wine cabinets. Their aim was to create wine cabinets that replicate the conditions of chateau cellars. You can read about the Eurocave Origine, Classic and Other Wine Cabinets here. 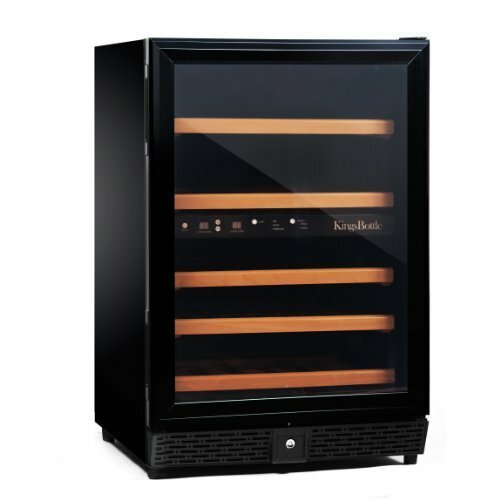 The 92 Range currently offers one model the V292 wine maturing cabinet with one temperature zone. The Première Range – includes three 1 temperature-zone models: the V101 small, the V166 medium and the V266 large cabinet. These cabinets have less features but maxiumum capacity. The Eurocave Compact wine cabinets are specifically designed for wine lovers who don’t have much space in their homes for wine storage. These solidly-built yet space-efficient wine cellars can be built in kitchen cabinetry or used as standalone in a dining room or whereever you can fit it into your home’s furnishing. The wine cabinets occupy less than 2 square feet floor space yet provide larger storage capacity compared to other wine refrigerators with the same size offered by other manufacturers. Since the venting is in the front of the cabinets don’t expect them to be completely silent. The EuroCave Compact Series Wine cellars are available in 3 storage capacities and you can opt for a single temperature zone cabinet for maturing wines, or a multiple temperature one to keep your favourites at serving temperature. EuroCave offers several customization options so that you’ll have a wine storage unit that is perfect for your needs. You can opt for additional sliding or adjustable fixed shelves to have flexibility in organizing your wines inside the cabinet. All models are available with reversible solid door or UV-filtering full glass door. For each model you can customize the shelving configuration: the number of sliding shelves and adjustable fix shelves for bulk storage. Price of EuroCave Compact Wine cabinets is between US$ 2300-4600 depending on capacity and the level of customization (shelving configuration, solid or glass door). A cabinet with a solid door will be a few hundred dollars cheaper, but if you want to admire and show off your prized wines then go for the full glass door. EuroCave Wine Cellars are designed to be operated between 0 – 35°C ambient temperature, so you can even place it in a well-insulated garage or basement. Cabinet walls containing 5 cm thick Cellular Quality Insulation (CQI) for maintaing constant temperature inside the cabinet with very low fluctutaion – this also ensures energy efficient operation, since the fairly low fluctuation in temperature due to the high quality insulation doesn’t require the compressor to run very frequently. To have an idea on how good this insulation is: this 5 cm thick layer has insulation efficiency equiavalent of almost 2 m thick earth layer. The so-called Twin Process Thermal Regulation system ensures stable temperature between 10 – 14°C (50°F – 57°F) creating an environment existing in natural wine cellars. All doors are reversible so you have flexibility in finding the best placemnt for the cabinet within your home. Lock and key set is a standard accessory. The ribbed inner aluminium SRA (stone relief aluminium) walls enhance the cellar’s abiltiy to maintain the required humidity level, (aluminum conducts cold and heat better than the plastic interior of cheaper wine coolers & wine refrigerators). Audible and visual alarms to warn user when the door is not closed properly for instance. 10 years on the cabinet. Noise level of Eurocave wine cabinets is around 39 – 42 dBA. Electricity consumption: EuroCave wine cellars have relatively low electricity consumption around, 0.9 – 1.0 kWh/day. These attractive wine refrigerators have dimensions that allow you to find them place in your home even if you’re tight on space. The smallest of the compact EuroCave wine cabinets is the model V059 in which you can keep 53-56 bottles of wine (the capacity is calculated for standard 750 ml Bordeaux bottles). Weight: 43 kg, 95 lbs. Price: US$ 2300 – 2500. The new V059 wine cabinet by EuroCave has a touch pad electronic control panel with which you can easily adjust and monitor temperature and humidity levels inside the unit. It also has a sound and visual alarm that warns you in case you left the door open by accident or when it’s time to replace the charcoal air filter. You can read more about the EuroCave Compact V059 wine cellar here. Read a review on the Eurocave Le Petite wine cooler and preservation system that stores 12 bottles of wine. Next in size is the Model V159 with max. capacity of 106 bottles (standard Bordeaux type bottles). Weight: 48 kg, 105.82 lbs. 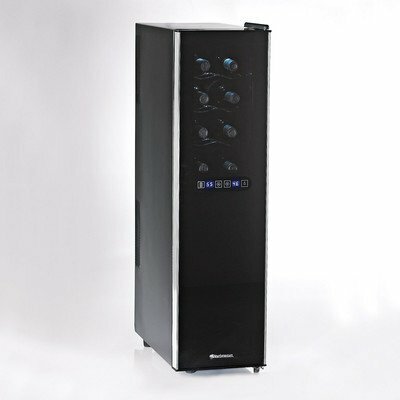 The most capacious single temperature zone EuroCave Compact Wine Cabinet is the model V259 that can accommodate max. 167 bottles of wine. Weight: 61 kg, 134.48 lbs. Price: US$ 4200 – 4600. These wine cabinets are designed specifically for serving wine. 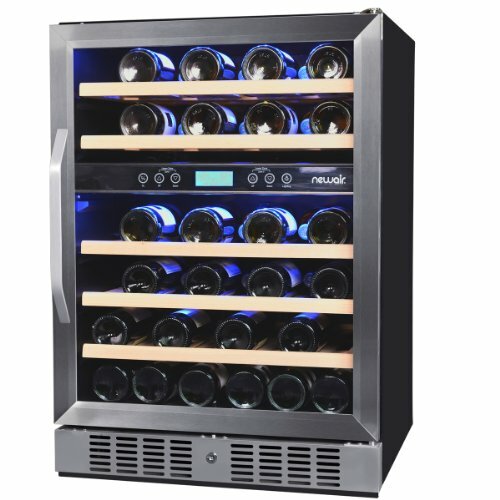 The 6 to 10 temperature levels allow you to bring several types of wine to the ideal drinking temperature within one cabinet. Model S259 – holds max. 164 bottles – 10 temp. levels. Transtherm Wine Refrigerators are similar to EuroCave wine cellars regarding design, features, and price. Liebherr Wine Cabinets are also top-quality wine storage units offering multiple temperature zone models, like the Liebherr WS 14300 3-Zone Wine Cellar. Amana Wine Cabinets offer storage capacity for 143-203 bottles of wine in 3 temperature zones. 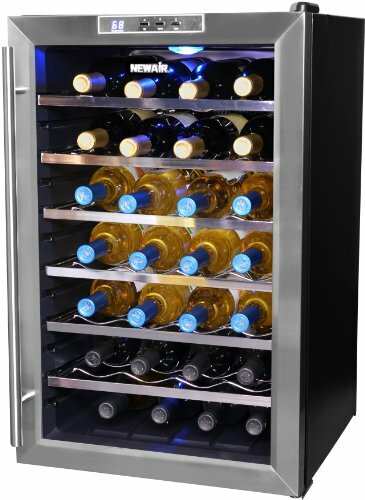 The Sub-Zero WS-30 Dual Zone Wine Refrigerator accommodates up to 147 bottles of wine. 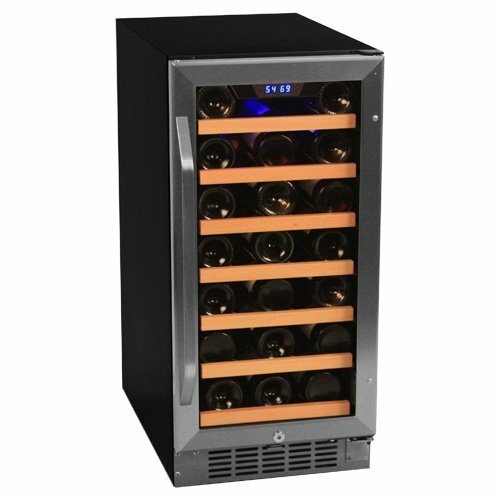 Compare 150+ Bottle Wine Coolers Under $ 2000 – comparison of 3 popular budget 150-160 bottle wine fridges. N’FINITY 340-Bottle Wine Cellar – a double door large wine storage cabinet at affordable cost by Wine Enthusiast. The EuroCave Sliding Shelves glide on PVC rollers and you can pull the shelves out to pick and take out a bottle of wine. These shelves can hold 8 bottles of wine (standard 750 ml Bordeaux bottles, but sliding shelves are available for champagnes and magnums, too). The EuroCave sliding/rolling shelves cost around US$ 65-70 . EuroCave Adjustable Fix Shelves are designed for bulk storage and can hold up to 61 bottles (standard 750 ml Bordeaux bottles). They’re for the EuroCave Performace and Compact Series and you can get a shelf for about US$ 40-45. Presentation and display shelves are also available. Visit our main page about EuroCave Wine Cellars.